What Can PhoneSheet Do For You? PhoneSheet is as simple as it is an effective business tool for anybody whose daily life involves managing numerous phone messages and contacts. 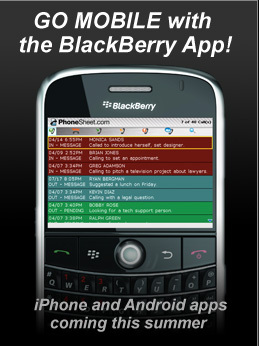 You can access your personal “PhoneSheet” 24-7 through PhoneSheet.com or via your BlackBerry device when on the move with our mobile app. Ideal for the modern executive, PhoneSheet provides for multiple users to be logged in at any given time, allowing a single "phonesheet" to be updated by numerous staff members at the same time, even from multiple locations. Many businesses get stuck with overly complex, expensive software solutions when all they really want to do is effectively manage their phone messages. PhoneSheet offers the ideal solution for just a few dollars a month.